We all know that shoe shopping can be great fun; trying on every pair in the shop and falling in love with that one pair that you MUST have in every colour available. This is great when you want to keep things casual or on a night out, but what about shoes for work? Finding the perfect pair of work shoes can be a challenge, and of course any professional outfit should be complimented perfectly by the right pair of shoes. For many women, looking their best at work is almost mandatory so getting the right pair is a must. So where do you start? Whether it’s an office environment or otherwise, choosing the right pair of business work shoes that’s both practical and stylish as well as comfortable might seem like an impossibility, especially if you’re not really sure what it is you’re looking for. Do you choose heels or flat work shoes? Do you go for black work shoes or a different colour? So many questions to ask yourself so why not take a step back from the stress of choosing, and let use do some of the hard work for you. The first thing to consider when choosing, is the types of work shoes there are and what is most appropriate for your job. If you’re working in a hazardous environment, dainty court shoes with a stiletto heel probably aren’t going to be the most sensible. In much the same way that a pair of safety boots probably aren’t going to be necessary if you work in an office. Court Shoes - Probably the most common choice for work, classic courts are usually simple in design and versatile. Court shoes can however come in all sorts of different designs and styles with different types of heels such as block heels and wedge heels if you’d prefer more stability. Opting for a simple, unfussy pair of courts will often serve you well and will work perfectly with dresses, skirts and trousers alike. If you want extra security, go for a pair of court shoes with an ankle strap. If you’re on your feet for long periods of time, court shoes probably won’t be the best choice for you unless you go for a low block heel which will provide the foot with the necessary support without putting too much strain on the ankle or toes. Brogues - Stylish, practical and comfortable, women’s brogues are a great choice if you want to smarten up a tailored suit but don’t want to wear heels or - if the weather isn’t great - they can give you a little extra protection from the elements. Ballet Flats - If maximum comfort is what it’s all about for you, then ballet flats are where it’s at. If you work in an office but don’t want the restriction of wearing other types of shoes, then flats could be the answer. However, ballerinas that have a super-flat sole aren’t really suitable for long term wear if you do a lot of walking or standing in your job. The reason for this is the lack of support and protection they offer for your feet. Either choose a pair that have a small heel or add a good quality insole with instep support. Boots - Choosing boots over shoes - particularly in poor weather - is probably one of the best choices you can make. Much like shoes, they can come in all sorts of different styles too. From knee high boots with a flat sole, to ankle boots with a tapered heel. In some workplaces, safety boots are essential and even though it’s not the most stylish footwear in the world, there should be no compromise on health and safety! TOP TIP: If your role does involve extended periods of standing (such as nursing or waiting tables), shoes with a cleated rubber sole will provide you with the support and grip needed. Memory foam insoles can also added an extra layer of protection and comfort. What Are the Best Women’s Shoes to Wear to Work? There are a lot of things that will dictate the best type of shoes to wear to work, and what’s suitable for you may not be suitable for someone else and vice versa. The first thing to consider is the type of environment that you’re going to be wearing them in. So, wearing smart women’s sandals in an office environment for example probably wouldn’t be an issue, but they wouldn’t be suitable in a warehouse or kitchen as the risk of injury would be too great. The best type of footwear in hazardous environments would be a pair that provides the feet with full coverage with a rigid heel and toe, a cleated sole will also provide you with suitable traction to help prevent trips and falls. Also avoid heeled shoes that could potentially cause you to be unsteady on your feet (though we would recommend staying away from any heels that are difficult to walk in!). Another thing to consider would be the weather. Summer work shoes can vary greatly from winter shoes in that they don’t necessarily need to be as robust. So lighter shoes such as open toed court shoes or dress sandals can be great. If your workplace is quite open-minded and is happy to embrace a more smart/casual look, go for canvas shoes. Often made from cotton, they’ll prevent sweating and ultimate prevent the issues associated with sweaty feet, such as sores and of course the smell! On the other hand, winter work shoes should be hardy and warm. Boots are great as it means you’re able to “layer up” with chunky socks. If you’d prefer not go for boots, chunky court shoes or ballet flats paired with cotton rich tights can be a great alternative. Comfort should always be a primary concern when it comes to work shoes. These are shoes that you have to wear all day so it’s important they don’t cause you any issues. Fit - Shoes that are too tight will not only cause soreness and potential infection from rubbing but continued wear can cause ongoing problems with bunions which can be extremely painful. Our handy shoe fitting guide should help. TOP TIP: Be aware that your feet are likely to swell over the course of the day, so try new shoes on as late in the day as possible. Heel height - The heel height of shoes can play a big part in how comfortable a pair of shoes can be. High heels can put a huge amount of pressure on the ankle and toes so are not recommended for long periods of standing. Super-flat shoes on the other hand can cause issues with the tendons in the soles of your feet, so it’s always best to find a nice, even middle ground that works for you and your day to day activities at work. The shoes shouldn’t slip off your feet, if they do, they’re too big. Try a smaller size or slimmer width fitting. You should be able to wiggle your toes freely. If you’re unable to do this, consider a different size or style. Pick as wide a heel as possible for maximum support. Don’t expect shoes to stretch to any significant degree. Over-stretching shoes can cause them to lose shape and wear them out quicker… as well as the obvious heightened risk of sores and calluses! Rotate the shoes you wear. Try and avoid wearing the same shoes every day of the week. Doing this will mean you’re varying the type of shoes your feet are subjected too so they don’t get too stressed, any sweat in the shoes is given a chance to dry and of course your shoes will last longer! Use orthotics and shoe inserts where you can. Take your shoes off as much as possible, if possible. And if you spend a long time on your feet during the day, be sure to take the weight off whenever the opportunity arises. What Shoes Should Women Not Wear to Work? No woman should ever be told what they should and shouldn't wear, that we agree on wholeheartedly! But when it comes to work shoes, sensible decisions should be made from a practical and comfort point of view. It’s also worth thinking about the vibe those shoes might give out. So if you’ve got a big important meeting for example, a crazy coloured pair of platform stilettos might be too distracting and take focus away from the real reason you’re there. Going for simple, neutral colours and styles is a sure fire hit. Choosing new work shoes can be tricky business. But taking into account the environment you’re going to be in, the time of year and of course what’s going to be comfortable for you on a daily basis, there’s not much that can go wrong... and your feet will certainly thank you for making the right decision! Want to Look Your Best at Work? 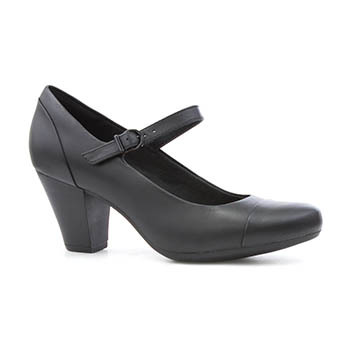 Find your perfect work shoes online in our women’s shoes range!